Try our Ionic Foot Detox! All you do is soak your feet in our foot bath, and relax! The water will actually change colors as you detoxify. You won't feel a thing, but you're being cleansed through your feet. Afterwards, your feet will be soft and beautiful, as if you've had a spa treatment! A foot bath is like a magnet that energizes cells and draws out toxic material. It is an ion generating device that uses electricity stainless steel electrodes, salt, and water to create a healthy, nourishing, ionic bath. It is used to cleanse, balance and enhance the bio-energy at a cellular level in your body. The soles of the feet and armpits are two of the body's discharge pathways for toxins (hence the odor). The use of antiperspirant blocks one of these pathways, and over time can result in an accumulation of chemicals in the body. The feet, being the largest pathway of the body, have been used for centuries to eliminate toxins. Traditionally, feet were placed in salty sand, to foot detox. This method, however, was effective but slow, and had limitations. The foot bath uses a direct micro-current that is very similar to low voltage electro-stimulation or cold laser, both of which have been proven to increase cellular ATP (stored energy). Introducing this increase in energy stimulate the cells to purge toxins at a much higher rate. The warm salt water is used as a conduit for exchanging ions - in other words the foot bath is like a magnet that energizes the cells and draws out toxic material right before your eyes. Water, metal, and salt will combine to produce a light water color change, as well as objects in the water even without feet being submerged. The ionic foot bath neutralizes toxins in the water the same way it neutralizes toxins in the body. 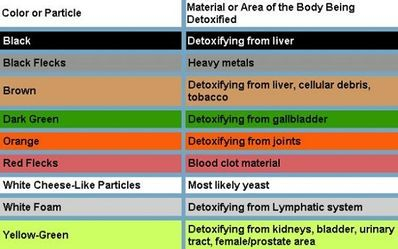 Remember, the body itself has high water content, and this is where toxins become isolated. As a general rule, depending on geographical location, about 20-40% of what you see in the water after a foot bath comes from regional toxins in the water, and the remaining 60-80% comes from the client's body while using the detox foot spa. In humans, organs such as the kidneys and the large intestine eliminate wastes and toxins, maintaining the internal environment in the most ideal condition. However, there are limitations: If we eat too many poison-producing foods, or not enough of the materials needed to clean out poisons, then our internal environment changes beyond the body's control. It deviates from the optimum conditions in which our cells can live, and the cells become sick and die. Many illnesses are the body's attempt to clean up its internal environment. The body secretes and maintains many different types of fluids; the most important is blood, which has a pH level of 7.4 - slightly alkaline. This alkalinity has to be kept almost constant, even minor variations are dangerous. With too acid blood, the heart relaxes and ceases to beat; with too alkaline blood, it contracts and ceases to beat. In today's toxic environment, tissue acid wastes, chemical and heavy metal residues build up in the body faster than ever before, resulting in a greater incidence of allergies as well as a whole range of mental and physical ailments. To combat these increasing problems, herbal and homeopathic detoxification programs as well as saunas are being offered by alternative health practitioners. Most healing traditions offer body purification as a means of healing and as prevention of disease. Pimples, rashes, dark circles under the eyes, swollen joints, yellow, green, and blotched complexions often indicate a buildup of toxic waste products inside the body. Detoxification with the Ionic Foot Bath have been shown to substantially reduce and even eliminate these conditions. Dietary modification help reduce future accumulations of toxins. Ever increasing exposure to toxicity in and around us make ongoing periodic detoxification essential in order to maintain health and prevent disease. The Ionic Foot Bath, in combination with a healthy lifestyle, provides a thorough and efficient way to high energy levels and promote long term wellness. Here at Bridge to Wellness, we feel that it is our duty to educate and inform our customers of the hazards that they are in contact with on a daily basis. It is now up to you to decide if you want to continue being toxic and risk your health and the health of your loved ones, when you now have a natural, drug free, no side effects, healthy alternative. The detox foot bath is pre-programmed with an internal timer, set for a 30 minute session and will alternate between negative and positive charges throughout the session. The system has been tested for maximum ionization of the water and the ultimate health benefit to the client. Is the ionic foot bath safe for everyone? People with pacemakers, defibrillators or other electrical implants should not use the detox foot bath. It is not recommended for children under 8 years old. It's safe for children 9 to 15 years old, but they should limit their sessions to 15 minutes.